It’s been a while since I’ve made a drink that’s blatantly foofy, so I figured it was about time I appeased those readers — such as my wife and my friend Brenna — who go nuts for fancypants drinks. And man, considering this thing’s name and it’s ingredients, I don’t think you get much more fancypants. The Angel’s Delight. Pour your ingredients into a cocktail shaker, shake vigorously until foamy. Pour into a chilled martini glass. Seriously. Pepto Bismol pink. But, the true question lays in the taste? It’s good. I recommend using a straight gin — such as New Amsterdam — which has a sweeter flavor and less of a bite than your Tanquery does. Otherwise this is just a bit too bitter. 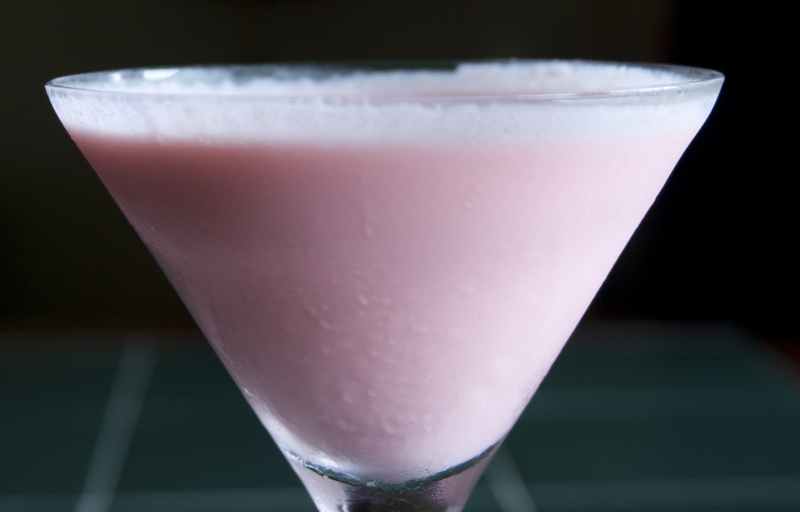 But, using a straight gin makes the sweetness of the triple sec, cream and grenadine work. It reminds me of a boozy base for a Shirley Temple, plus cream, minus ginger ale. Anyway, Jenn loves it, so you foofy drinkers will definitely take to it. Just simply too sweet for my tastes, however.